This option is used to plot one channel in a multi line display and can therefore simulate a helicorder plot. This is a very different option from the plotting from a continuous data base (see 8.5). Interactive processing is not possible in this mode except for selecting time windows for event extraction, see below. Low and high cut for filter: Give values or return for no filter. A band pass cannot always be used with a low frequency low cut(filter unstable) so if e.g. a LP record is to be simulated, use filter limit 0 to 0.1 Hz. The zero means it is a low pass filter, not bandpass. A filter 10 to 0 would mean a high pass filter. Seconds pr line: Number of seconds on each line. Max count: The absolute maximum count to be used for full scale. 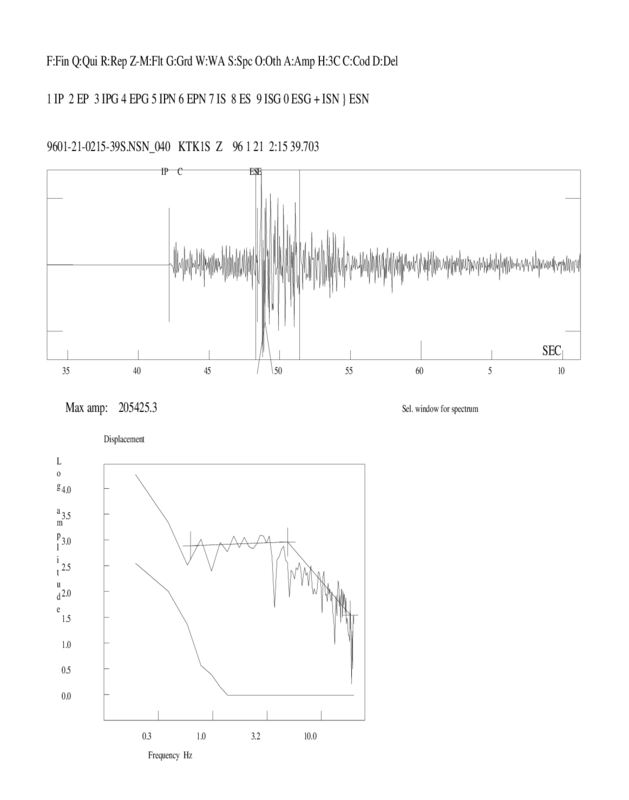 Since many lines and possibly many pagers are plotted, it is not possible to use autoscaling, and like on a seismogram, a fixed value must be set. Lines pr page: Number of lines per page. Componet code: The component code, max 4 characters. MULPLT will plot from the first file given from the filenr.lis file and then continue to plot as long as more file names are given in filenr.lis. Alternatively if plotting from EEV, it will start with the current event and continue until the end time. 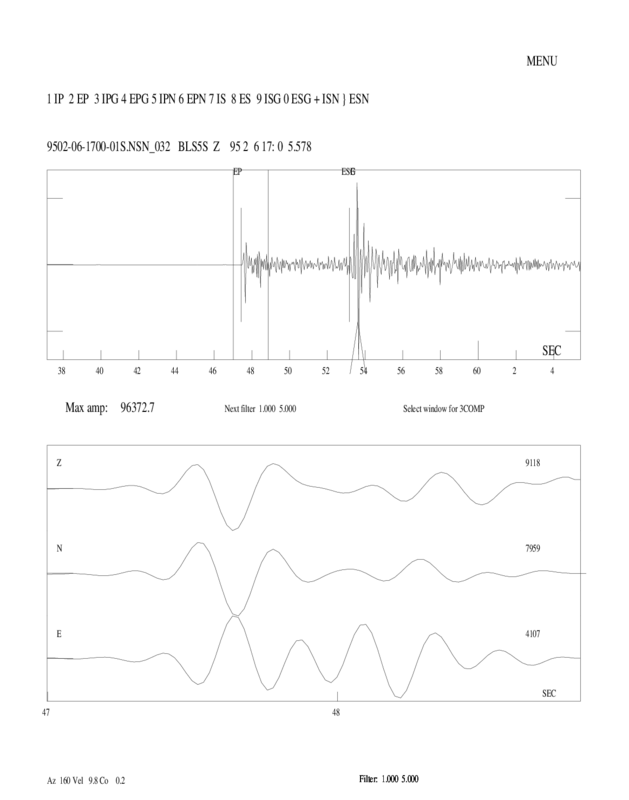 So if a month of data files are given, a month of seismograms will be displayed. There is no requirement that the input files follow each other in time (no time gaps) since each file is plotted on the page where it belongs in time. However, the files must be time ordered. The continuous option can therefore be used to check availability and timing of continuous data. Discrete events can also be plotted in this mode if one want to get a display of when the events occurred. However, if filtering, it is assumed that the files follow each other in time since a few points are carried over from one file to the next to make the filtering continuous. Figure 8.5 shows an example. To extract events shown in the continuous plot one can mark a given time window by typing 's' and 'e' at the start and end of the required time window (see Figure 8.1). Selected time windows are, when plotting is finished, written to the file mulplt.ext and to the screen as wavetool command lines. By executing mulplt.ext (type sh ./mulplt.ext or source mulplt.exe in UNIX, on PC the name will be mulplt.ext.bat so just typing the name mulplt.ext will start the extract process) the time windows given in mulplt.ext, are extracted from the continuous database defined in SEISAN.DEF. The data files are extracted in the local directory. These files can now be registrated in a REA database with autoreg. One cannot delete a ``Start'' or ``End'' time mark. So, if another time window is required pick the new window and delete the line in mulplt.ext with the old time window before data is extracted. The time marks is written to the file mulplt.ext for data to be extracted and processed. Type ``s'' and ``e'' to add time marks. Figure 8.1: Example of time marks at the ``Start'' and ``End'' of an event recorded at the KBS station. The time marks is witten to the file mulplt.ext for data to be extracted and processed. Type ``s'' and ``e'' to add time marks. If the SEISAN_LOGGING parameter is set to in SEISAN.DEF the analysis done with this option, will be saved in a log file in REA/BASE_/LOG/YEAR/MM. BASE_ is the default database, YEAR and MM is the year and month the analysis was done. The log files are named mulplt.cont.data-time.log, where date-time is the time of the analysis. Logging is on by default.